More and more parents are going gender-neutral when it comes to choosing a baby name. Our expert explores the rising new trend of unisex baby names. With nontraditional baby names on the rise, it makes sense that many moms and dads are opting for androgynous monikers. 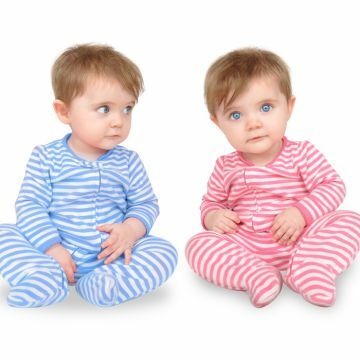 "Parents are inventing names and using words or last names as first names that have no traditional gender," says Baby Name Wizard Laura Wattenberg. But with more options come more questions. Wattenberg helps sift through the confusion. You almost never hear a parent who's expecting a boy say, "I want a name that doesn't indicate his gender." Yet, parents of girls are often trying to fight sexism with the choice; there's evidence that for today's adults, a masculine-sounding name is a workplace advantage. Parents of boys who choose androgynous names, such as Phoenix, usually just like the style. Still others are coming up with new sets of sounds— Brailey, for instance: masculine or feminine? Well, it's whatever your child is. How Does a Name Become Feminine or Masculine? Throughout history, when traditionally male names like Leslie and Courtney started to be used by parents of girls, there was a certain tipping point when parents of boys stopped using them. Today we're seeing names, such as Lennon or Oakley, arising at the same time for boys and girls, then leaning one way or the other. If a name is androgynous today, there's no telling whether it will be more popular for boys or girls in 20 years. A generation ago, you'd have no way of knowing Ashton would turn out male and Addison female. Spelling: How Does It Fit In? Nowadays, what I've dubbed "andro-girly style" is common, meaning masculine names spelled in a "girly" way, like Charleigh. In fact, newly invented names often start off unisex but then start to be spelled differently for boys and girls. An -on usually connotes a boy, while a -ynn tips it to the girls' side (e.g. Jalon is typically a boy, but Jaelynn is typically a girl). The more creative a spelling, the more likely it's a girl's name, such as Paysen or Elliet. Can a Name Be Truly Gender Neutral? It's rare. Quinn, Rory, Rowan, Casey—those are as close as you can get. And even they may shift to one side or the other. So Should I Pick a Unisex Name? You have to be prepared for it to eventually tilt male or female and be OK with that. But it's also important to remember how much your baby's personality will determine the direction of his or her life, whatever his or her name may be. Laura Wattenberg is the creator of babynamewizard.com's NameVoyager and NameMatchmaker tools, and the author of The Baby Name Wizard ($9, amazon.com).